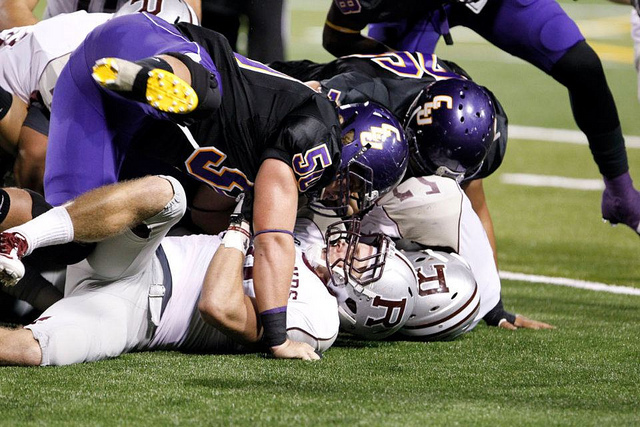 The pancake block is a maneuver that isn't very popular with most football players. Defensive players hate the pancake bitterly, and will do almost anything within their power to avoid receiving a pancake block. For the offensive linemen, however, the pancake block is the ultimate expression of blocking dominance. All great offensive line players learn how to properly perform the pancake block and to use it effectively to intimidate defensive players. Break from the huddle and approach the line of scrimmage as you would on any play. Set up, once at the line of scrimmage, in your position along the offensive line. Assume a standard, 3-point stance. Put a little more weight forward on your down-hand than you would on a normal play. This will give you a bit of an advantage once the ball is snapped and will increase your forward momentum and help you to stay low. Wait for the ball to be snapped, anticipating and remembering the snap count. Fire out of your 3-point stance, as soon as the ball is snapped. Engage the player that you're supposed to block. The position of this player will vary, depending on what play your team is running and what type of blocking scheme your football coach has implemented. Get under your opponent's pads. The key to the pancake block is leverage. To gain leverage over your opponent, get your center of gravity lower than theirs and use your positioning to block them vertically, beginning to bring them off of the ground. Roll your hips. The muscular power of the pancake block comes from the most powerful muscle groups in the body, your leg muscles and core muscles. When you roll your hips you'll effectively use those muscle groups to thrust the other football player off the ground. Follow them into the air. Once your opponent's feet leave the ground, it's all over for them. Explode up off of the ground, exactly as you would if you were tackling them, and keep their momentum going upwards. Follow them back to the ground. The most devastating part of the pancake block is the moment when the offensive lineman lands, with their full weight and power, squarely on the defensive player that they've just embarrassed. To perform the pancake block properly, don't just push the player down, but also drive them into the ground with your weight. The pancake block is an extremely effective maneuver when used accordingly. If you become too aggressive and try to use it too much, however, defensive players may adjust and come up with ways to counter it. The pancake block is most effectively used during running plays due to its aggressive nature. Always keep your head up on the football field to avoid spinal injuries and never, under any circumstances, play the game without proper attire and protective equipment.